Before planning the trip to Batumi, one should answer two perennial questions: “Why?” and “When?” In this article, we will try to help you find the correct answer. First and foremost, one should realize that Batumi is a resort town. Tourists come here to relax on the beach, enjoy the nature, but not to enjoy the sights of the Georgian pearl. Therefore, if you are a big fan of active rest, you can spend in Batumi 2-3 days for complete recreation. Conversely, if you want to swim, sunbathe, drink Georgian wine, dine and try khinkali or khachapuri, you are welcome to the friendliest city worldwide. By the way, when it comes to beach holidays, Batumi becomes the Mecca for lazy beachcombing and sunbathing. Here is the greatest example of your typical day in Batumi. Georgians begin the morning with a cup of coffee. One of the most popular and authentic coffeehouse is located on the waterfront and bears an original name “The Aygushi” (or “On the Beach”). We recommend the experienced tourists to start from that point. 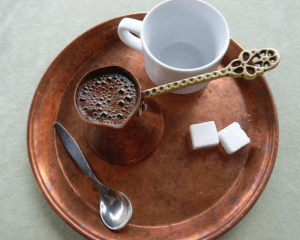 Here you will be served an excellent Turkish coffee for just 1 lari. The gourmands will tell you the latest news and give advice on what else to see in the city. To keep the conversation, ask the visitors who Aygushi actually is. With affection and love, they will tell you about an old cafe owner who knew every one of them by the face and continued to work at the age of 80. 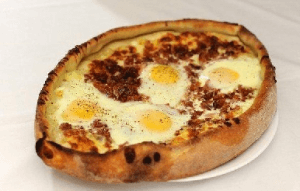 Forget about the dishes under the name khachapuri sold in any country. Once you taste a true Ajaria, you will realize that Geaorgian khachapuri makes a huge difference. Some of the most delicious khachapuri are cooked in the cafe “Lagoon” (Gorgiladze Street 18). Five lari, and you are ready to savor this culinary masterpiece. Just keep in mind that khachapuri is a very satisfying meal. Thus, the portions are large, so you can safely take one khachapuri for two, if you aren’t very hungry. Enjoy lovely restaurant quality in the circle of family and friends. The atmosphere, cleanliness, views of the lake and the Singing Fountain, the absence of dress code (shorts come in the evening) are considered the best benefits about the restaurant. To feel a true taste of the Georgian cuisine, you can order two servings kebab (gorgeous) with a side dish, tkemali, 100 grams of vodka, tea, coffee and khachapuri. The service is very professional and efficient. Live music in the background adds to the marvelous end of the evening with a splendid gesture. The largest and the most popular club in Batumi is located on the Promenade. You cannot go past the club, as its building is huge and futuristic. In addition, the club has a great sound and a nice crowd. From time to time the nightclub welcomes world stars. For example, Coolio, Modjo, Snap gave their live performances at the club. The cost of entry to the party depends just on the lineup. You will come across an effective face-control, but quite loyal one.